Primary residence. Second home. Retirement home. Investment. Whatever your situation, ACE is the place to start when you want to make informed decisions regarding the sale or purchase of a property. Our home inspectors are professional, experienced and specially trained in all aspects of construction. 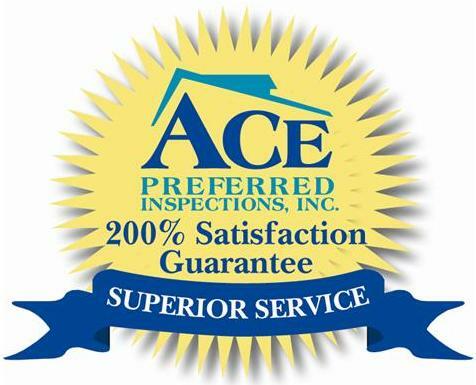 ACE inspectors are trained by a licensed professional engineer; our expertise exceeds the state minimum standards and our inspection service includes a variety of benefits that protect you and allow you to close on your transaction with confidence. 1. A 100 Day Home Warranty that covers many of the things that can happen after the inspection. 2. 90 days of Termite Protection Plan coverage to treat new termite infestations that can occur after the inspection. 3. A complimentary Engineering Consultation with one of our staff engineers when significant issues are identified by your inspector. 4. An Appliance Recall Chek service to identify fire and safety hazards in the home. 5. A 200% Satisfaction Guarantee - if you are not happy with the inspection, we will refund the inspection fee and pay for another inspector to examine the house. The cost of a home inspection is very small relative to the home being examined. You are likely to find that our fees are not the lowest available. ACE inspectors are thorough and focused. For a buyer, we present and describe every fact about the property being purchased. For sellers, we deliver a report that helps you market the property while providing 100% full disclosure, with no worries if a buyer coming back and questioning anything regarding the property. Our inspectors and staff take pride in delivering a positive inspection experience before, during and after the appointment. Should you or anyone else involved with the transaction have any questions hours, days or months down the road, give us a call and we will do whatever it takes to meet your needs. Home inspection appointments are available 7 days a week. Our report that includes digital photos is typically delivered via email no later than 0800 on the day following the home inspection. All inspectors are equipped to deliver the report on site if you have a tight schedule; please let us know in advance so we may allow extra time on site. To schedule a home inspection, call our office or use our automated scheduler by clicking the schedule an inspection icon. Thanks for choosing ACE. We look forward to working with you.